← If evolution started over, how similar would its results be? Last weekend, I finally saw the movie Captain Phillips. I had been a bit slow to watch this one, because I wasn’t sure how the events would be portrayed. I was pleasantly surprised to find the movie to be a mostly thoughtful chronicle of those events, although I don’t doubt that it took some dramatic liberties. The movie chronicles the attack by Somali pirates of a freight ship off the coast of Somalia, and the subsequent kidnapping of Captain Richard Phillips off of that ship, and the resulting confrontation with the US Navy. What impressed me about the movie was that it gave us a brief glimpse of the world that the pirates came from, and the utter desperation and poverty of their lives. 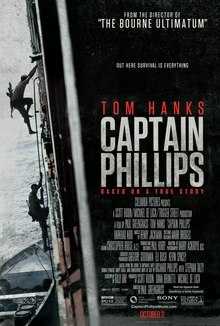 I found myself having sympathy with just about everyone in the movie, both Captain Phillips himself and the ship’s crew, and with the pirates. Being familiar with the news story, I watched with a growing sense of tragedy as the pirates made one faithful decision after another, all driving them toward a confrontation they probably had little comprehension of. None of this is to say that I thought the Navy didn’t do exactly what it needed to do, effectively and heroically. But watching the movie made me uncomfortably aware of the lottery of birth, that any of us could have been unlucky enough to have been born in the same situation as those pirates. There but for the whims of chance go any of us. This entry was posted in Zeitgeist and tagged Captain Phillips, Film, Maersk Alabama hijacking, Phillip, Piracy, Piracy in Somalia, Somalia, Tom Hanks, United States Navy. Bookmark the permalink.